A sign for Naloxone hangs on a wall as students learn to put together a Naloxone spray gun in a class on opioid overdose prevention held by non-profit Positive Health Project on August 9, 2017 in New York City. (CNN) - Naloxone, a drug that rapidly reverses opioid overdose, has become more widely available as the United States struggles with an epidemic of drug abuse. But state laws that provide wider access to naloxone, sold under brand names including Narcan, may unintentionally increase opioid abuse, according to a new study published in SSRN, a collaborative research network. As access to a lifesaving drug reduces the risk of overdose death, more dangerous drug use -- including higher doses -- becomes more appealing, the researchers speculated. Such increased abuse may even lead to higher death rates. "While naloxone can be a good harm-reduction strategy, it's clear that naloxone access alone is not a solution to the opioid epidemic," said Jennifer Doleac, one of the study's authors and an assistant professor of public policy and economics at the University of Virginia. "As currently implemented, these policies may be making things worse." Originally used only by doctors and first responders, naloxone can quickly restore normal respiration to a person whose breathing has slowed or stopped due to an overdose of heroin or prescription painkillers, according to the National Institute on Drug Abuse. In recent years, some states have expanded naloxone access -- by permitting purchase without a prescription, for example -- as a response to the epidemic of opioid abuse. For the new study, Doleac and her co-author, Anita Mukherjee, an assistant professor at the Wisconsin School of Business at the University of Wisconsin-Madison, examined the effects of broadened access to the lifesaving drug across the United States.
" 'Moral hazard' is an economic term meaning that people will do more of something when it becomes less risky," Doleac said. She gave the classic example of automobile seat belts, which may encourage more reckless driving, according to some studies. "We were interested in to what extent making opioid abuse less risky leads to more opioid abuse," Doleac said. She and Mukherjee estimated the effects of naloxone access laws across the 50 states and made comparisons across regions. "The main takeaway is that broadening access to naloxone leads to an increase in opioid abuse," she said. "Even though the risk of death per opioid use has fallen, the number of uses increases enough that the same number of people are dying," Doleac said. Overall, broader access to the drug also has no net effect on mortality rates, she noted, though in some regions, increased deaths occurred. In Midwestern states, wider access to naloxone correlated to a 14% increase in opioid-related deaths, plus an 84% increase in fentanyl-related deaths. Greater access also swelled the number of opioid deaths in the South, the study claimed. However, the West and Northeast experienced the opposite effect, in which increased access was followed by decreased opioid deaths. The impact of access appears to be related to treatment availability, Doleac said. "In the best-case scenario, saving someone's life with naloxone gives them a chance to get treatment," she said. "But that will only happen if there's treatment available." Doleac and Mukherjee also estimated the average effects of naloxone access laws in urban areas across the country. After the passage of laws that expanded access to naloxone, "arrests for possession and sales of opioids increased by 17% and 27%, respectively, opioid-related visits to the emergency room increased by 15%, and opioid-related theft increased by 30%," Doleac and Mukherjee noted in their study. Drilling down on ER visits and deaths, the researchers compared two urban groups: the top 25 largest cities (based on population) versus small to large cities. In small to large cities, naloxone access laws were followed by a 23% increase in the number of opioid-related ER visits and a 42% increase in fentanyl-related deaths. However, the same effects were not seen in the largest cities. Doleac said she feels confident in the findings, as the "analysis has been put through the wringer over the past year." But Mary Hawk and James Egan, both assistant professors, and Chris Keane, an independent researcher, all of the University of Pittsburgh Graduate School of Public Health, had some cautions about the new study. They were not involved in the research, though they published a separate recent study of naloxone. "First, we need to be careful about assuming causation from correlation when thinking about the impact naloxone laws might have on crime, opioid use, and other factors," Hawk, Egan and Keane wrote in an email. "We are particularly concerned about the authors' suggestion that increased access to Naloxone may result in increased crime or theft," they said. Just because both expanded during the same time period does not mean that one caused the other. And even if cause and effect were proved, they would not propose removing access to a life-aving drug simply to reduce crime, they said. "Is naloxone in itself the answer to opioid epidemic our country is experiencing? Certainly not, but it is part of the continuum of care that we are working to develop," they said. 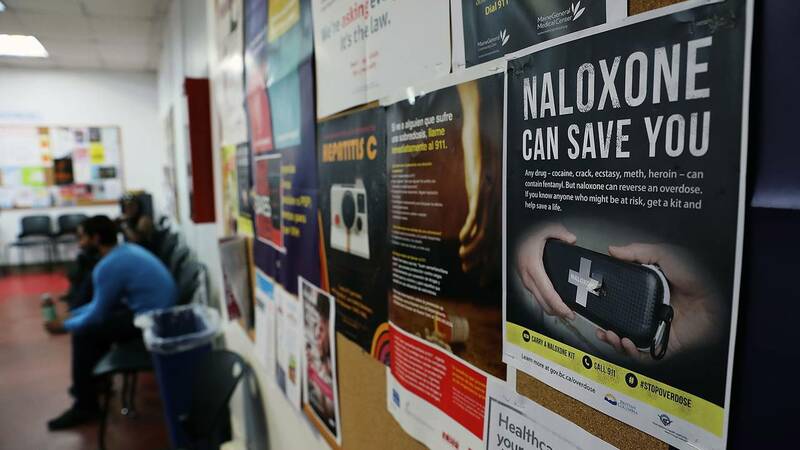 "Our own recently-published study suggests that distributing naloxone in community settings where those who use opioids are likely to visit may result in a drop of approximately 65% of deaths" compared with beforehand. Hawk, Egan and Keane say they understand concerns about opioid users who are saved from overdosing numerous times without appearing to change, since their repeat behavior could cause compassion fatigue among first responders. "Addiction is often described as a chronic condition of which relapse is fairly common," Hawk, Egan and Keane said. "At a very basic level -- the longer we are able to keep individuals alive, the more chance they have at being successful in recovery." To withhold access to a lifesaving intervention is not only counterintuitive with regard to addiction treatment, it is unethical, they said. Philip J. Cook, a professor of economics and sociology at Duke University, said he finds the results of the new study "to be entirely credible." Cook, who was not involved in this research, said the results suggest "that some drug abusers are making choices based on their perception of the risks that they will die." "One implication is that opiate drug abuse has a voluntary element," Cook said. "It is to some extent a 'choice,' not just a compulsion, influenced by the perception of immediate consequences." Doleac said one thing is clear: "We need to keep working to find ways to reduce rates of addiction and mortality."